Wee Jots | Learning to be ever steady in who He is. My job, jam, gig, ministry: helping people align their emotions with God’s grace, love, and truth. Success rate for others: not too bad—if you count people wrestling with being made in the image of God, the depth of their brokenness, and God’s delight in them—as a journey toward healing and fullness of life in Christ. And not too bad if you can consider and maybe even believe that grief, joy, pain, and trust are not mutually exclusive and can live together in the messy glory of a heart inhabited by God’s holiness and love and intimacy. Success rate for my own heart: not too bad … better than many years ago … and maybe I kind of have a handle on this … and I know I am not perfect and haven’t “arrived” and there are always rough spots to smooth out … but I seem to have a good idea how to roll in this God-connection-with-Kathie thing. This spring, summer, and fall were full of God cracking open doors in my heart I didn’t even realize I was guarding. Some led to rooms I tried to pretend didn’t exist and some to rooms I didn’t know I had; some were rooms I was pretty sure I had already done a good job straightening up and sorting out. I took these photos January 28, 2015 for a blog post I started that day. Felt like a clever and tangible representation of the jumble I felt inside. Cheers to me for closing in on nearly two years to touch the real letters of my heart. If there was a way to combine an eye-rolling emoji and a gratitude emoji, that would go *here*. From milk to marbles to a mess of a heart, who ever thinks a spill is good news? Usually, what ensues is panic. Mop it and catch it is the knee-jerk. If your heart dumps unintelligible blech like scattered wooden tiles, get the letters back in the bag. But maybe there can be something different in the spill. Maybe God is asking, politely and pleadingly, asking. Maybe He’s me reminding of truth, the truth of His own character. “By the way, kiddo, you aren’t lost. I haven’t wandered off, and I won’t let you wander into the weeds, either. I know you have boxes and cubbies and bins and shelves and labels and tags and all sorts of ways you try to organize, categorize, analyze, synthesize, theorize (Wow, you ‘ize’ a lot. Aren’t you tired? ), and try to keep everything around you—people, places, objects, emotions, unknowns—steady. And part of that steadiness reflects Me and I love it: you are calm and loving when the hearts of others are aching, and I often allow you to be a safe place so someone can get a glimpse of my immense joy and delight in them. But, sweetie, I never asked you to partition and sort your own heart to the extent that you don’t need Me. I never asked you to steady yourself. To handle everything to the point where I can’t even give you good gifts … surprises that delight Me and will delight you. “What if you let Me hold your heart again? Remember when you used to do that? I won’t lose it. In fact, if anyone is going to lose it, it will be you. You set it down places and wander off and forget it. You’ll organize and edit it to death, Kath. You pack your calendar and your brain and your here-let-me-help soul so full, it’s hard to get a word or moment in there with you. A good Father longing to give good gifts to a beloved daughter. How strange that we run from gifts! I mean, I get it. I’ve seen cartoons: wrapped and ribboned boxes can explode and cakes can have dynamite instead of candles. But they were usually handed out by a coyote and you’re probably a roadrunner. What if—with God—even a spill is a gift? It was a morning when everyone and everything made me homesick … both kinds of homesick, the “here” kind and the “then” kind. We are at the morphine days of G Mel’s homegoing. It’s about making her comfortable and giving reassuring words that it’s okay to let go. And laughing with her as she accidentally bites her low-dose morphine pill in half and the two pieces keep slipping out the opposite corners of her smiling, denture-free mouth; her family and caregivers keep popping them back in, adding water to wash them down, to have the tiny bits take turns sliding out again. Like trying to shoot marbles in a puddle. On Wednesday, she asked for permission to die: Would we be okay? Will she leave us with too much to do? Would she be causing a problem? My aunt and dad reassured her on all fronts: it’s okay to welcome complete rest from this side of heaven. As I ate breakfast in a small restaurant this morning, I sniffled often and tears welled again and again, not allowed to rush down my face solely because my waitress was too nice and I didn’t want to freak her out; she was the kind who calls me “Sweetie” even though she’s probably 30 … though I may have enough gray hair now to merit “Sweetie.” Controlling my blubbering impulse may not have been the best, since the thing that happened in its place was a kind of giddy laughter as I kept staring out the window and grabbing my coffee cup like a security blanket. It was chuckling borne of of gratitude for all kinds of goodness even in this hard time, and the realization of how goofy I probably looked taking each bite of crispy bacon—G Mel has demands about bacon sturdiness and when the strips don’t snap, she makes faces like a disgusted teenager—with my face contorted to keep from sobbing. So, instead of snot-snorting crying, I went for lunatic, red-eyed giggler. The celebration of having 45+ years with her (both my grandmothers are still alive at the moment … amazing) and the greed of feeling like I will never have had enough hugs and kisses. The joy of imagining her pain-, fear-, and worry-free, and then the thought of the planet without her revealing an ache in my heart that tells me my love for her runs even deeper than I know. Waking again and again in the night to pray for her and for her caregivers, even as I smile at the descriptions my parents share of how often G Mel just grins and moves her shoulders up around her ears now, like a happy, trusting, but not fully-comprehending toddler. I am homesick “here,” on this side of heaven, for my family in California, though we know it’s best for me to remain in Idaho at the moment, for many reasons. We have discussed again and again the gift of the time I had with her in April when she was still so cognizant, and being the talkie family we are (I have a friend who jokes that every event with us leads to “the inevitable coffee and discussion”) we have processed multiple times at multiple stages whether and when I should head south. And I am homesick for “then,” when everything is back together on the restored side of heaven, and there is no more missing each other. And the sobbing commenced, finally both strong and sad, reassured and heartbroken. Thank you, Lord, for your tender embraces here, in bacon and tires and yarn and your children. On this post-fall side of heaven, receiving love with open arms can be a challenge. We know about God’s grace and he “so loved the world,” but accepting the full, glorious joy of his love into our heart can seem too hard to hurdle. When we try to describe giving or receiving love with complete abandon, we often talk about babies: we delight in lavishing love upon them, expecting nothing in return. Wee ones are too small to be “useful” but we don’t mind one bit. We pour the full wonder of our hearts upon them and they revel in it; neither they nor we have any need of “earning” our love or favor. But something happens. We grow up and learn we better carry our own weight, write thank you notes, repay kindness with kindness. What, at its best, would simply be us learning to let our own gratitude pour back into the world gets a little twisted up and becomes paying back. And we silently learn to keep track. You give something to me. I thank you. I look for a way to repay. The next lunch? I’ll get it. Mow your lawn? Now we‘re even. Instead of learning to be loved, we learn to be even. And when we are old and our bodies start to fail and our money runs thin and we can’t pay for lunch and we can’t mow the lawn, it’s a long journey back to just receiving. To just being lavished upon. My grandmother is a handful of sunrises away from her 90th birthday. Her body can’t keep up with her still swift-moving ideas and her funds are dwindling faster than her retirement income replenishes. These “limitations” make it hard for her to feel worthy of love. And hard for her to repay the very kindness she aches for and her family delights to pour out … but that she also can’t help keeping track of. 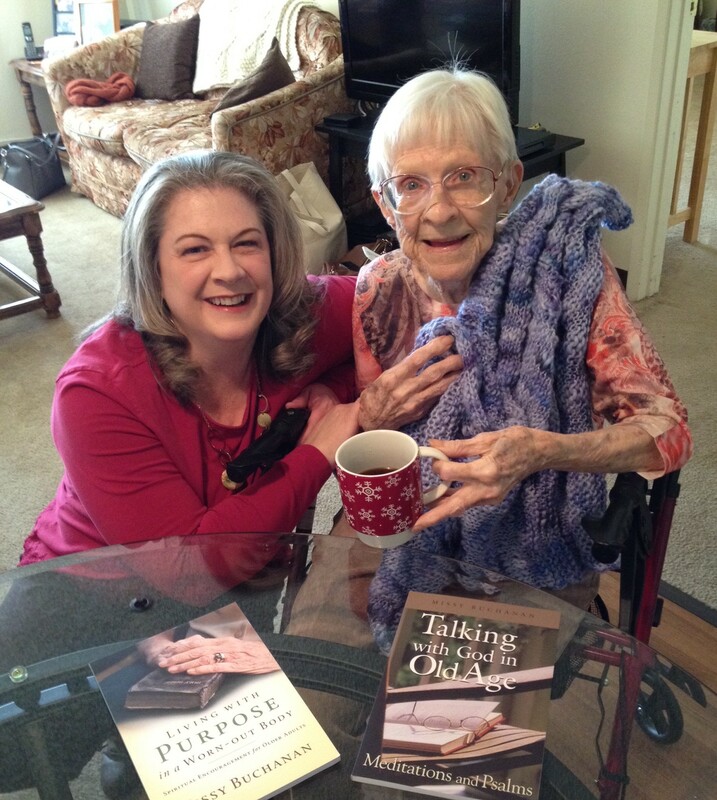 A month ago, she asked me what book of the Bible talked about old age and dying; I found devotionals written for aging seniors. She asked me to make her a blanket with yarn she never used when she didn’t learn to knit like she planned at age 88; I knit her a cozy lavender throw. She loves, loves, loves her coffee and misses the mountains in winter, so I decided a snowflake coffee cup was just the right surprise. When I present these goodies, she is overwhelmed with glee, so happy that dolphin noises come out of her: “Eeeeeeeee!” She snuggles the blanket and flips through the books and cradles the mug. Then it comes: “Oooohhhhh, I have to pay you for these books because I asked you about talking to God. And I just wish I could think of something to get you and I wish I could take you to lunch and I wish I could get out and buy things for you. You do so much for me! This is too much!” And a wave of embarrassment at not “being even” steals just a smidge of the love and fun from her happy heart, even as I express my utter thrill at bringing these gifts and being in her presence for every moment I can. I cringe a bit, but I am no different. I, too, learned along life’s journey to “keep even.” My response sounds just like hers when God pours out his sweetness and generosity on me, whether through his Spirit or the love of people around me. I revel in the moment until my own version of, “I just wish I could think of something to do for you! You do so much for me! This is too much!” kicks in. So, together, Grandma and I will practice in the time we have. To this mother-of-my-mother who has kept me awash in love from the moment I was born, when my only impressive acts were breathing and sleeping and demanding everything I wanted by wailing my lungs out, I will now return the same delight, the same patience, the same you-owe-me-nothing-for-my-love. And we will both receive with delight God’s unmatchable love and grace, giving our thanks, and instead of keeping even with him, just look for ways to keep letting it pour out around us. I travel around the world as part of my missionary career. I love it and I dread it. I love seeing new things and tasting new things; I get to practice keeping a straight face when scenes don’t look familiar and when my taste buds experience flavors far different from what they are accustomed. As I slid into the seat, I was warm with embarrassment and worry and failure. I assumed I was doing something culturally inappropriate or foolish in my standing on the bus and bracing myself with the hand straps. I thought I had been quiet and polite, standing where I was supposed to and not giving offense. My heart sank, since clearly I had blown it and this woman was trying to get me to stop being so stupid. My friend and travel companion, a woman who was raised in this part of the world, sensed my disappointment. When I apologized to her that I must have been doing something wrong because a woman much older than me made me take her seat, my friend explained to me it was local hospitality. Age had nothing to do with it; I was clearly a visitor in this part of the world and this woman was caring well for me, as her upbringing taught her. Then, another familiar sense overwhelmed me; once again, I had assumed the worst of me. The bus ride was a crash of cultures and my own fallen heart. In my home culture, it’s polite for me to stand and make sure anyone older than me has a seat, especially a senior citizen. Here, it’s polite for anyone of any age to give up their seat for a guest in their country. With a moment’s reflection and a little more information, my mind can process the difference and appreciate the experience. But by then, my heart has to be resuscitated; inside, I always first process anything uncomfortable or unknown as failure on my part. My fallen inner voice tells me all the time that I am not enough and if I want to be loved (at most) or not a disappointment to God or anyone else (at least), I need to get every step and every interaction and every choice just right. When things don’t go precisely the way I expect or I don’t know what to do and there is the slightest chance I might stumble, I always first interpret the situation and my feelings as my failure. It hadn’t crossed my mind that the elderly woman was being kind. It hadn’t crossed my mind to simply experience the moment with open eyes and heart, willing to observe and enjoy and learn. I was in full self-protection mode, only watching and processing my own actions, guessing at the impression I was giving others, striving to make sure that impression made people like me. Granted, it was just a brief bus ride with people I will likely never see again, but it tells me something about my instincts and inner habits; when I live in self-protection mode, I miss good things. I miss relaxing in the warm smile of a woman’s kindness; I miss seeing others and their real intentions, obsessed instead with myself; I miss learning in real peace and trust, clinging instead to whatever I think will keep me most acceptable to people, a false peace. Gratefully, I am gaining a better sense and habit of my already-complete acceptability in Christ. If I believe I am already wholly acceptable, it gives my heart space to process new information and new moments … and receive God’s sweet smile and generosity in the gift of a seat on the bus.